We bought Denali at an auction, and gave her a few months off to just be a horse. She started into dressage training and was doing well. However, the next few years proved challenging. 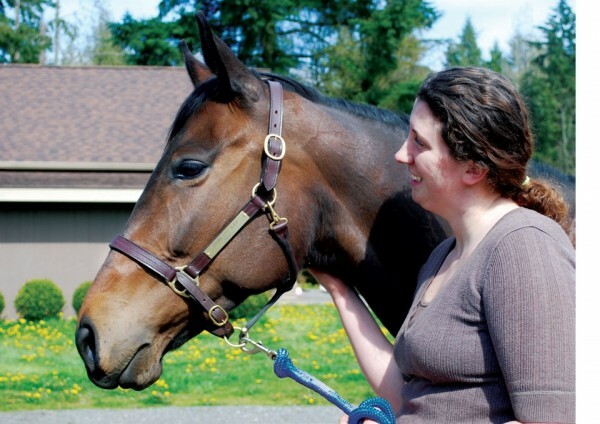 In September of 2009, she was diagnosed with a tear to her right hind lateral collateral ligament, and then in April 2010 she tore her left hind suspensory. I worked with my vet and we came up with a stall rest and rehab plan, and I started Denali on SmartFlex Repair. One year later, Denali is now back in light work, something that many people never thought possible. Denali was always a spooky horse who had a hard time focusing. I’ve tried several other calming supplements with minimal success, but when she got injured and had to go on stall rest, I knew I had to try something else. A week after starting SmartCalm Ultra, I noticed a HUGE improvement. Things that used to freak her out, she now ignored. SmartCalm Ultra has been a lifesaver, and I will never take her off of it! I’d used straight biotin before, but decided to try SmartHoof because of the added ingredients. I’ve really noticed an improvement in her overall appearance. She doesn’t wear shoes, and her feet look really good. The farriers are always impressed with her feet, especially because of the reputation thoroughbreds have. I know a lot of people try a hoof supplement for a few months and give up, but it can take up to a year, and I’m glad we stuck with it! Your granddaughter looks like she’s right in her elnmeet and knows exactly what she’s doing with this beautiful horse. Cheryl there’s no race here, you’ll post when you have the time. I’m sure that we all have those times in our lives where our attention is needed elsewhere. I’m looking forward to your posts but all in good time. Have a wonderful weekend!